Hummus is so versatile! You can serve it as a dip with veggies and pita, use it as a sandwich spread, or make it one of the feature flavors in a spinach wrap or tea sandwiches. I recently received a request for a hummus recipe from a loyal Green Sage reader, Anastasia. Her timing was perfect, because I had been working on this one when she wrote. This particular recipe has the sweet, rich flavors of roasted garlic and bell peppers, balanced with savory spices. The roasted veggies also give a nice smoothness to the texture, so you don’t have to use quite as much oil as you would otherwise. As with any recipe, the quality of the ingredients really matters. I highly recommend starting with dried chickpeas and cooking them yourself, rather than using canned chickpeas. Another important choice you’ll have to make is which brand of tahini (ground sesame seed paste) to use. 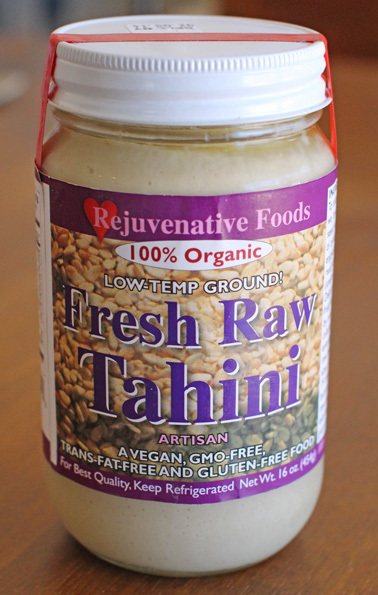 My sweet friend Katherine turned me on to Rejuvenative brand tahini. It’s ground at a low temperature and therefore qualifies as “raw,” so the nutrients of the seeds are preserved. Plus, it’s thick (not oily) and has a deliciously pure sesame flavor. You may be able to find it in the refrigerated section at WholeFoods, but it is also available on Amazon. 1. Cook the chickpeas. If you’re using dried chickpeas, soak them overnight. The next morning, rinse and drain them, and then put them in a large pot with at least 6 cups of water. Bring to a boil and then lower the heat to a simmer, stirring occasionally. Make sure that the chickpeas remain amply covered with water the entire time they are cooking, or they will burn and taste very bad. After about 45 minutes, add a 6-inch piece of kombu (kelp) to the water to add beneficial minerals (huge on iodine!) and enhanced flavor to the chickpeas, as well as to help tenderize them. Simmer for up to an hour more. Total cooking time will vary depending on the beans, so at around the 1:30 mark, start to taste them every 10-15 minutes or so, and remove them from the heat once their texture is perfectly al dente. Drain the cooking water. I love to munch on the cooked kombu, but if seaweed isn’t your thing, you can discard it. This may have yielded slightly more than the two cups of cooked chickpeas we need for this recipe. Store the rest in the fridge to snack on later. 2. Roast the peppers and garlic. I picked up a bag of “super sweet baby bell peppers” from Trader Joes, and used them for these photos. However, two regular-sized bell peppers would do just as well. 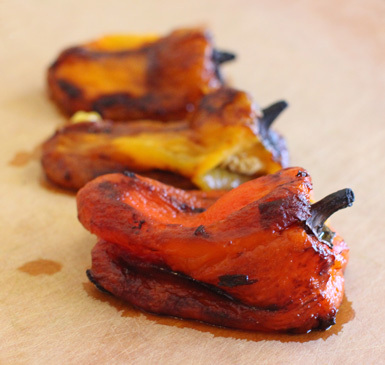 Wash the peppers and, using a sharp knife, pierce each side of each pepper so that steam can escape while roasting. Place them on a foil-lined baking pan. To prepare the garlic for roasting, peel the cloves, slice off the woody ends, and place them on a square of aluminum foil. Drizzle the garlic cloves with some olive oil and toss to coat, then wrap them up in the foil to make a little garlic package. 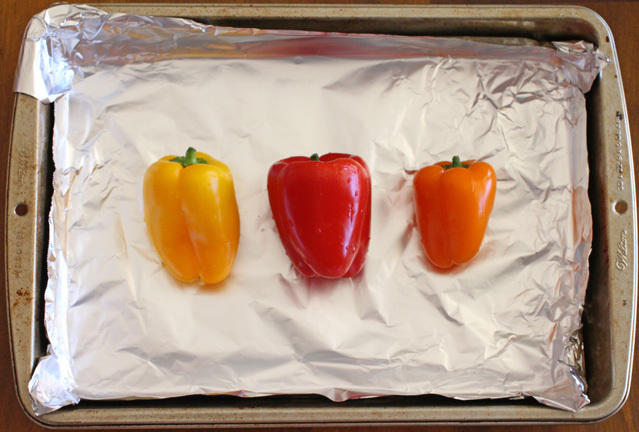 Turn on the broiler and slide the pan of peppers onto the top rack of your oven, such that the peppers are only a few inches away from the broiler. Carefully set the wrapped garlic on the bottom rack. Total roasting time will be roughly 15 minutes. Every five minutes, open the oven and use tongs to turn the peppers as they blacken. 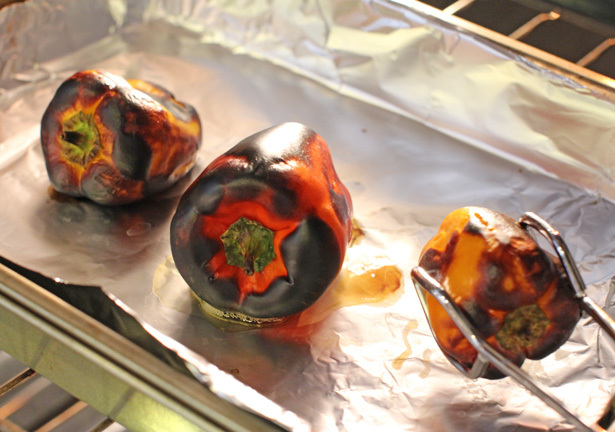 When the peppers are completely black, remove them from the oven and let them cool until you can handle them safely. They will look ruined, but don’t worry, it’s just the skin that’s burned. Inside, the peppers have roasted to soft, sweet perfection. In about the same amount of time, the garlic will also have roasted. Aluminum foil doesn’t retain heat, so feel free to unwrap the garlic package by hand. Check for doneness by sliding the point of a sharp knife into the middle of your largest clove. If it goes through easily, it’s ready. The garlic will be slightly browned and smell incredible (see the third garlic image above). Remove the blackened skin from the peppers by holding them under cold running water and peeling the skin away. I managed to keep them intact for the photo below, but don’t be concerned if they fall apart in your hands, as long as they don’t get washed down the drain! While you’re at it, you can rinse out the seeds and pull off the stem, too. 3. Time to make the hummus! Place all the ingredients except the water into your food processor. Turn it on and allow the ingredients to be blended thoroughly. The texture may be thick, so add the water a tablespoon at a time and re-blend until you achieve the consistency you like. If you prefer a stronger lemon flavor, you can use more lemon juice instead of water to thin the hummus. If you prefer a richer flavor, another option is to substitute more olive oil for the water. 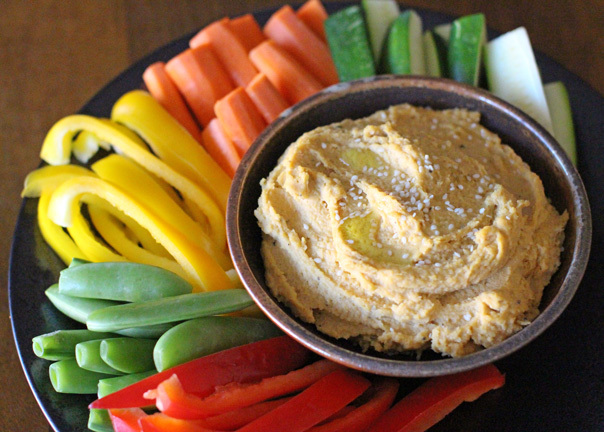 Serve your delicious hummus as a dip with cut veggies. I like to drizzle a bit of olive oil over the bowl of hummus and sprinkle some paprika and sesame seeds on top, too. It’s yummy with just about any vegetables, so choose your favorites. Mine include more bell peppers, carrots, celery, zucchini, sugar snap peas, broccoli and olives. Store leftovers in the fridge in a covered container. What’s healthy about this recipe? Chickpeas (garbanzo beans): Chickpeas are a great source of plant-based protein. They are rich in the vitamins folate, thiamin and B6, and the minerals manganese, copper, phosphorus and iron. They also provide a lot of insoluble fiber, which is hugely beneficial to the digestive tract and colon. Tahini (ground sesame seeds): Peanuts are to peanut butter what sesame seeds are to tahini. Sesame seeds are rich in beneficial minerals, including copper, magnesium, and calcium. The seeds also contain special substances known as sesamin and sesamolin, which are lignans that can help reduce cholesterol and blood pressure. And like all seeds, they pack a nice protein punch and offer healthy fats as well. The nutrition data on sweet red peppers looks almost like a daily multivitamin, as it is very rich in Vitamins A, C, E, B6 and folate. Sweet yellow peppers are similar to the red ones, but while they offer less Vitamin A, they provide a ton of Vitamin C, as well as additional potassium and manganese. 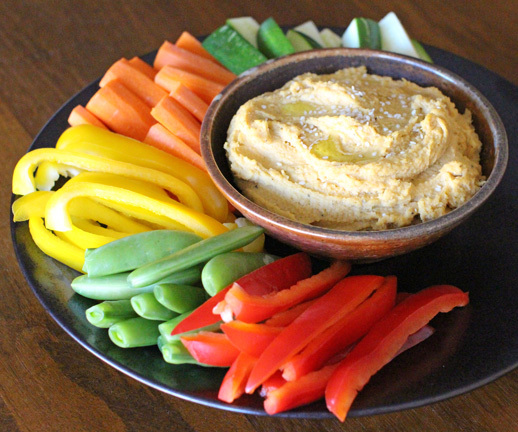 6 Responses to "Roasted Garlic & Bell Pepper Hummus"
thank you! looking forward to making it. Finally made this yummy dip. Made it with only red sweet peppers and it was a little sweet and great with celery sticks. Liked the consistency suggestions and adding water made it how I liked it. Thanks so much! Made this finally with red peppers only and it was sweet and perfect texture for me with additional water. Yummy with celery sticks. Thanks! Loved this recipe! This is my to go to page for hummus!